Bradford Creative and Performing Arts Center (BCPAC), 2 Marilyn Horne Way, Bradford, Pennsylvania, a local non-profit arts organization, presents a wide variety of professional artists and ensembles during their annual season. National touring companies, professional theater, and cultural entertainment are all offered at great ticket pricing, making BCPAC events a must see! Past performances have included, Bradford native, world-renowned opera star Marilyn Horne, Chicago, A Chorus Line, 42nd Street, Evita , Hairspray, Cats, Donny Osmond, Carol Channing, the Pittsburgh Ballet Theatre, the Pittsburgh Opera Theater, Dance Alloy, Pittsburgh Symphony, and the River City Brass. For your convenience, tickets may be booked online. Groups and motorcoach are welcome, please email or call their office for group pricing. 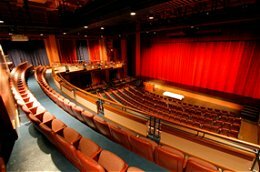 Never miss an event, email us now at arts@bcpac.com to have your name added to the mailing list.